20% off foodbill. Limited Seats. Must say 20% on number of people chosen. Food was pricey n not to par of expectations ⭐️??? ?We wont be goin back. Only the nasi goreng was ok. 1st batch.average, 2nd batch nicer. Rendang was dry.. no gravy-Veg rendang was so bad. Disappointing! Fantastic place and specially loved the Nasigorang the national dish of Indonesia!!! God mat. Trevlig personal. Helt ok som helhet. The food is as authentic as it comes. The service was friendly and attentive. A very friendly Swedish/Indonesian Couple with lovely delicious dishes! God mat, bra service men supervarmt årets varmaste dag! I had the rendang, which was excellent -- essentially identical to what one finds in Indonesia. Others had meals that were good: by looks, one was outstanding; two others had meals that looked good but not exceptional. Kid's meal looked good as well. Cozy place; good desserts. Selections limited since it's basically a two-person show. Main Course very small portion, te rendang beef didn't taste so much because leak of ingredients. KangKung Cah exteremely small portion not value for money as well over cooked and watering. The Gulai Domba taste lots of seasoning and salty... This is my own opinion. Just didn't felt value for money and we are expected real Indonesia taste but unfortunately didn't feel the *Punch*. Very sorry to write this just because we are expecting good result from the kitchen. Very good food & service. Small & cosy restaurant. ​Lovely place, great service, very tasty dishes with elegant food styling.​Varmt rekommenderas. 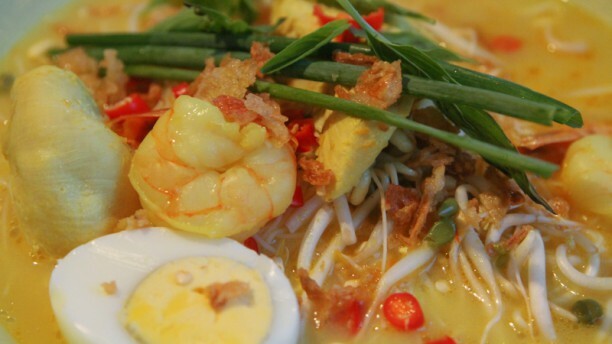 Real authentic Indonesian cuisine in great value. Everything we had tasted great. Do not miss the water-spinach and rendang.